Analytics + Software = Marketing! Marketing, especially in e-commerce, just isn’t what it used to be. 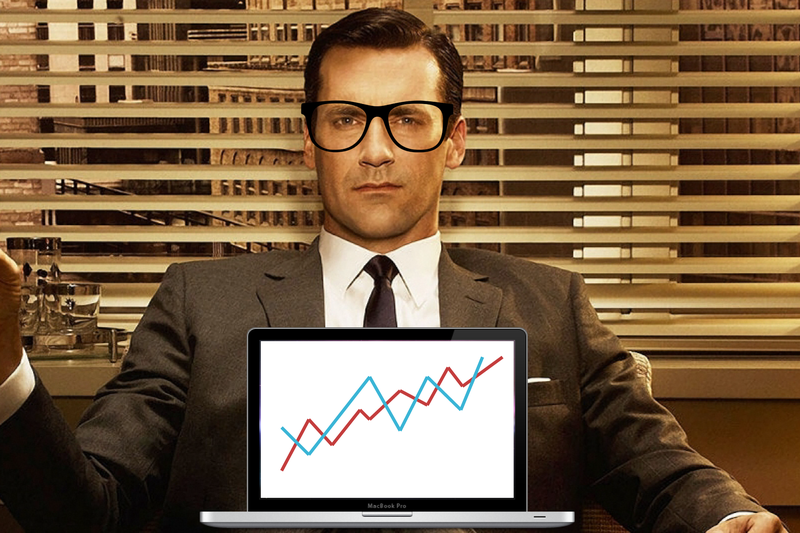 As a marketer, you can still aspire to be Don Draper...so long as your version of Don Draper spends his days consulting metrics and speaking the technical e-commerce lingo. After all, you have direct access to the technical systems that power your e-commerce initiative. You don’t just rely on IT to run your website; you’re elbows deep in Magento. You probably spend as much time with tools like Google Analytics as you do writing copy and planning campaigns. On the one hand, yes – numbers have always driven retail. But these days, the numbers don’t just include the balance sheet fields that make your sales and accounting teams stay up all night. As a result, marketing and tech are more blended than ever before, and marketers spend as much time looking at analytics as they do crafting the campaigns/content/brand experience. They’re using Hubspot’s SEO tools to find hot keywords…then building blog posts around those keywords to optimize traffic. They're consulting with web teams, or perhaps even doing the work themselves, to add “sexier” marketing copy to one of their product pages…then rushing to Google Analytics to see how much better the new description converts. They’re using Buffer to track Twitter activity and MailChimp to track email activity, and are probably also testing out another analytics-tracker in beta just to be at the forefront of a new trend. And, as a result, they’re engaging with customers better than ever before. If you’ve used any of these programs before, you know that it doesn’t take long at all to get comfortable maneuvering around their sleek UI’s and friendly FAQ’s on the corporate site. It’s easy to forget that these are actually quite powerful programs whose counterparts, ten years ago, would have been controlled solely by IT. If you have an iPhone, you’re already a part of this trend. Back in the old days, most technology was sold to businesses, not individuals – unless those individuals had a lot of money and the technical know-how to operate these dense systems. Flash forward to today, when people use the same smartphones to take photos of their kids and conduct 30% of their business functions, and it’s clear that this is no longer the case. Technology is now being developed for the “non-technologists,” who are then championing these products and services in the workplace. Your IT teams used to power your e-commerce initiative in-house from start to finish. It was tedious work that occupied the majority of their time, and the systems were so dense and complicated that it simply wasn’t worth it to teach, say, a marketer, about how it all worked. But the big guys had purchased the technology for the company, so everyone had to adjust. These days, however, the Square Spaces and Shopifys of the world have revolutionized this chain of command and brought the e-commerce keys directly to the folks who can utilize them most. In most cases, it makes sense that the team that knows most about what the consumer wants – the marketing team – also plays a crucial role in the company’s forward-facing site. As a result, a one-person shop can build an e-commerce site in a day that rivals what a giant retailer could offer ten years ago. And an entire marketing team can control the copy, aesthetic, and technical strings that make an e-commerce site convert. Companies (like Salsify) push marketers’ visibility of the e-commerce chain even further, providing powerful, easy-to-use alternatives to the clunky PIM and DAM systems that companies inherited when IT ruled the roost. And the technology is only getting better. Check Out: Our recent infographic about the technical ecosystem of e-commerce. Proof that you have friends who won’t make you wade through the techie stuff alone. As we’ve laid out in this post, a heavy emphasis on analytics and the consumerization of IT have changed the role of marketers in e-commerce. Get you started thinking more like a techie.